Wow, I can't believe I'm still hanging in there!! Today's challenge are Metallic Nails, and when I think of Metallic, I think of deeply saturated foils. 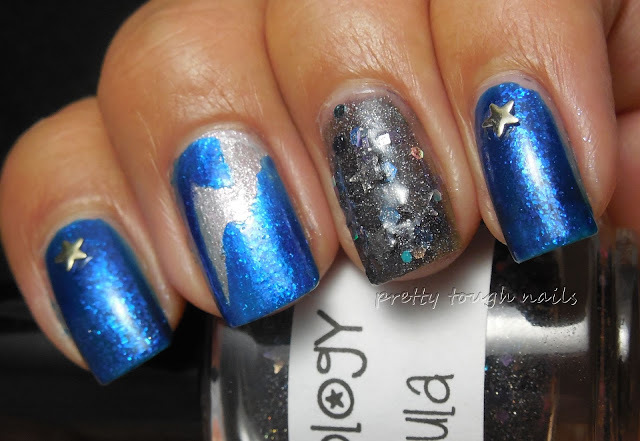 The first one that comes to mind is one of my favorites, Orly Stone Cold, a gorgeous deep blue foil that was released a couple years ago as part of the Mineral Fx Effects collection. Here, I used two wonderfully fluid coats except on my ring finger which I accented with Glitzology Nebula. 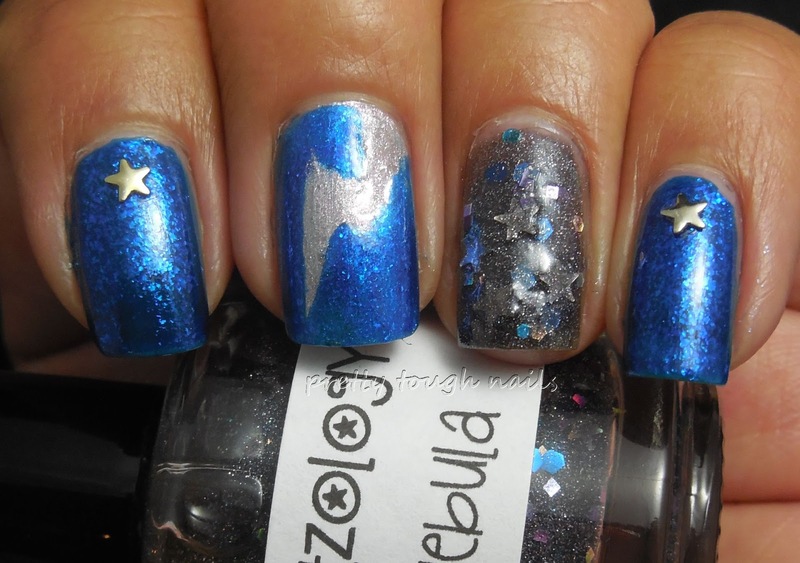 Glitzology Nebula is a charcoal based jelly glitter with holo stars, silver and blue hex glitters. 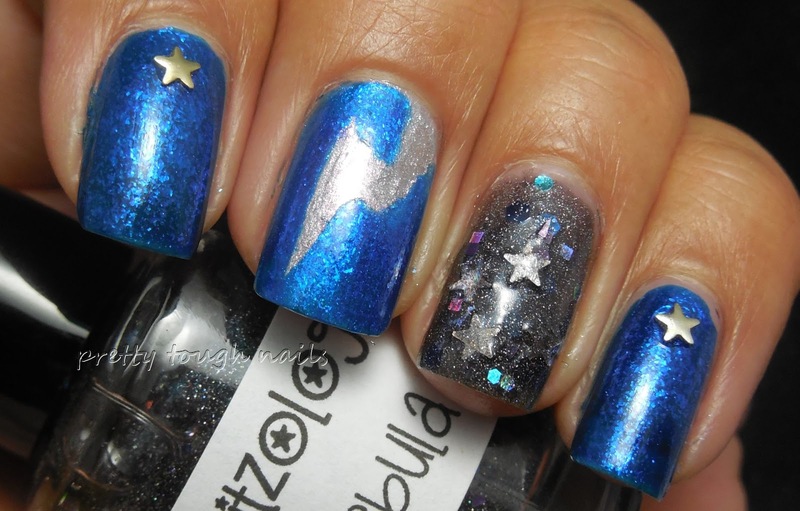 It's a bit glitter dense and after three coats it got a little chunky and some of the stars didn't lay flat. Next time I'll remember to layer this over another base color so I can minimize the glitter. On my middle finger I accented with a lightning bolt of Brucci Blue Horizon, a blue tinted silver foil. I finished the mani off with star shaped studs that I got from the Born Pretty Store. I love the foil-y flakey goodness of Orly Stone Cold, and look how bright and saturated that blue is! It reminds me of a little blue racing car. Zoom zoom!! I'm still perfecting the art of the perfect skittle and so far, this one ain't half bad. Remember to stop by and admire the other ladies manis for today's challenge! Gorgeous mani! That Glitzology is really pretty , it's a shame that the shop is closed. I just love how sparkly it is. I agree, they had some really great glitters! I hope it comes back again.